Making this stew was quite eventful. I had made the vegetarian version here and I have to say it was absolutely delicious. 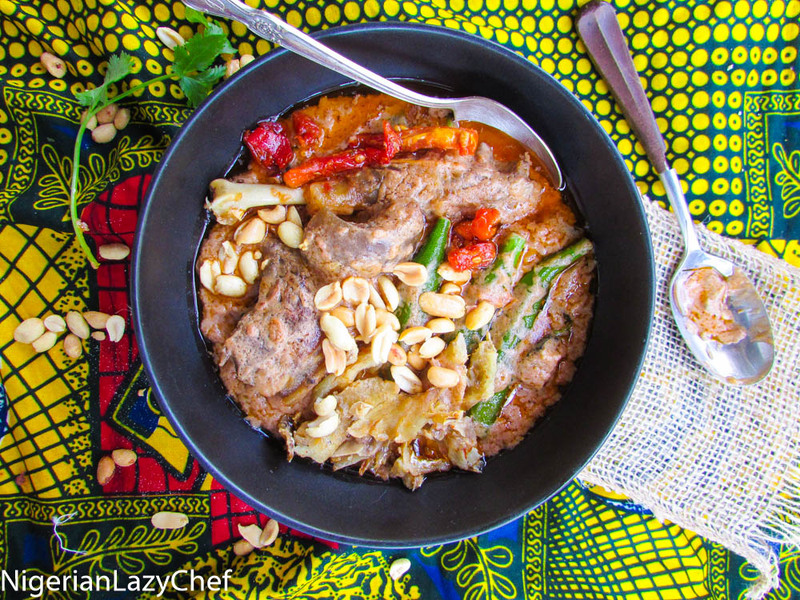 Making this version was a little different from the vegetarian version and a lot more different from the Nigerian version; well in my opinion. I have tried the Nigerian version once, but this one did it for me. I now remember a comment from a friend about my “Dine Africa” project. I can’t say that this recipe kicks it off, but it does show you how vast recipes can travel and have a niche where ever they land. Growing up in Nigeria with the type of parents I had, we never really explored a lot of soups. My dad was set on Egusi and Achi and my mother was a sucker for Oha soup. She actually plants an Oha tree wherever she goes. So, you see, making this soup was quite an adventure. being a food blogger, I have opened my taste buds to pretty much everything food. As in I would try anything once sha; at least when it comes to food. And with my dine Africa project what choice do I have ay? Mix 2 cups of stock with the peanut butter until smooth; then set aside. Heat the oil in a heavy bottomed pot, add the meats and stock fish; then brown them. Add the onions, and sauté with the meats; then add the garlic and ginger and sauté until fragrant. Stir in the tomato paste for a few minutes; then add the plum tomatoes. Cook until almost reduced. Pour n the mixed peanut and stock and add the remaining half cup of stock. Bring to a boil; then reduce the heat so that the soup comes to a low simmer. Cook for an hour or 45 minutes making sure that you stir occasionally to prevent burning. Once the oil floats to the top, stir in the okra and dry fish. Cook for about three minutes so that the okra does not get soggy;(it's best to steam your okra separately and serve with the soup) then stir in the basil(if using), set aside and serve with any side. 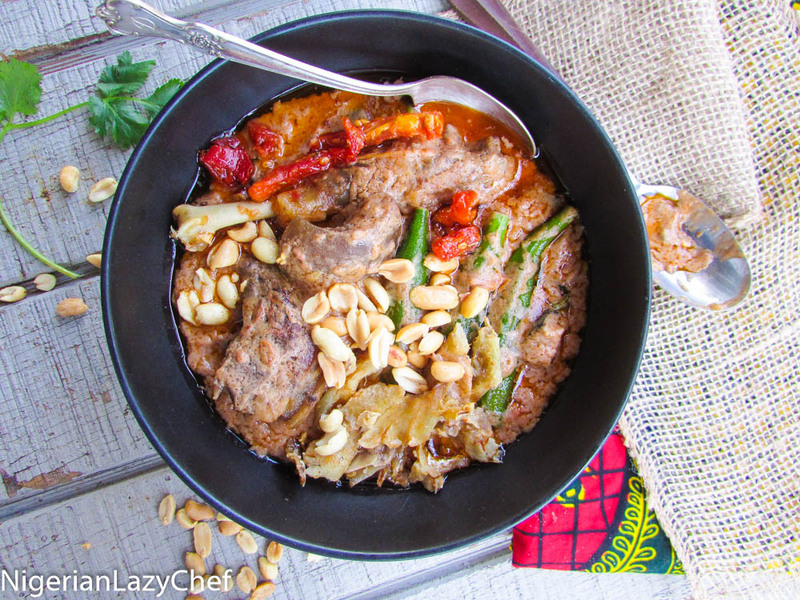 This entry was posted in gluten free nigerian recipes, Gluten free recipes, Peanut butter soup, Peanut butter stew, stew, Stews, Uncategorized and tagged African peant butter stew recipe, Ngerian food blog, peanut butter soup recipe, Peanut butter stew recipe.